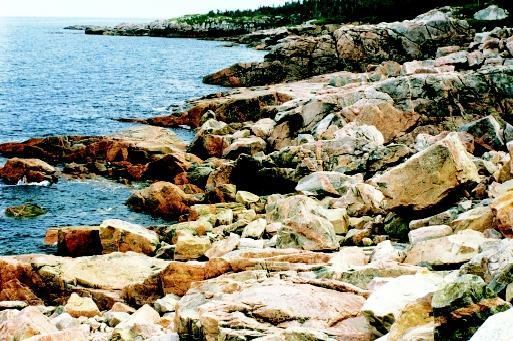 Coastal zone management programs seek to protect rugged and remote shorelines as well as heavily used beaches. All coastal habitats are vulnerable to pollution and overdevelopment. Americans love the seashore and the water. Nearly half of all the construction in the United States since the 1970s has been on the seacoast. By the year 2000, 80 percent of Americans lived an hour's drive or less from the seashore. The National Oceanic and Atmospheric Administration, the primary federal agency responsible for managing the oceans, has projected that by 2010 half of all Americans will be living in coastal counties. Globally almost two-thirds of the world's largest cities are coastal. Sixty percent of people on Earth live within 97 kilometers (60 miles) of the sea. The reasons why so many humans are coastal dwellers are that coastal areas and oceans have provided a large part of the food that people eat, and have served as the major transportation highways long before there were adequate roads, railroads, or airplanes. The coasts are desirable places to live, offering recreational opportunities such as swimming, boating, fishing, snorkeling, and diving. Coastal areas also are home to marine mammals and other sea life, and can be rich in minerals and other energy sources. 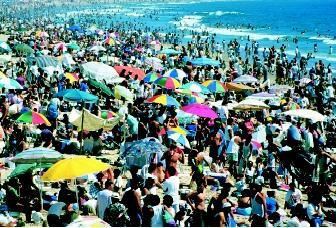 People flock to beaches and coasts for recreation, business, and home ownership. Coordinated management is needed to protect the land and water quality of coastal environments. fresh-water sources, and solid waste (garbage) disposal. The increased human activity has strained the ability of nature to replenish and clean itself. Therefore, Americans have gradually established regulations to guide how the seashore is developed and how coastal waters are managed. The three major water resources to examine are (1) the ocean itself, (2) brackish waters, and (3) fresh waters. The ocean itself is often considered the planet's most vital ecosystem for making life possible. Oceans comprise 97 percent by volume of all the Earth's living space for plants, animals, and humans. The oceans contain vast living and nonliving resources. Reefs, beaches, and other areas are among the ocean environments directly affected by the quality and temperature of the water. Moreover, coastal areas have served as the entry and exit point for what has always been and still is the major mode of commercial transportation: marine shipping. Ocean temperatures and the flow of currents are vitally important in regulating climate. Many scientists have shown that the rising temperature of the oceans could be contributing to global warming . In addition, warming temperatures may cause polar ice to melt, which would raise the level of the oceans and cause vast flooding in the heavily populated seaside areas. The ground under oceans, especially near coastal areas, contains enormous oil and gas resources. As easy and ample supplies of these hydrocarbons so necessary for an energy-intensive economy and society such as the United States become scarce, pressure increases to commercialize these suboceanic sources of energy. Drilling for, pumping, and transporting ocean-based oil and gas resources to onshore refineries without creating serious damage to the water and marine life is a delicate process. Both federal and state laws regulating offshore drilling are constantly being reexamined. The interests of oil companies, electric power-generating plants, consumers who enjoy affordable energy, and environmentalists can sometimes collide. Rivers and their coastal estuaries supply coastal areas with brackish water. Estuaries are extremely important habitats for a wide variety of animal and plant life. Turtles, fish, crabs, clams, mussels, and other sea life (including coastal mammals) all benefit from healthy estuaries and other coastal wetlands that often are the nurseries for young animals. Coastal wetlands and marshes also act as sponges and filters, retaining water and slowing or preventing it from rushing uncontrollably downstream, which would produce erosion. These wetlands also slowly filter out sediments and chemical contaminants that otherwise would reach the ocean. Development as well as contamination from pesticides and herbicides, industrial pollutants, sewage spills, and other sources of pollution are degrading the quality of coastal ecosystems. For example, in the 1990s a huge area deemed the "Dead Zone" was discovered in the Gulf of Mexico at the mouth of the Mississippi River. This area, covering 12,800 square kilometers (5,000 square miles), is almost devoid of any life as a result of runoff containing nitrates (a component of some fertilizers), pesticides, herbicides, and other chemicals from farms and industries upriver. The Dead Zone threatens fish, shrimp, and other commercial seafood, as well as recreational fishing, and is a potential risk to tourism. Construction and intensive development are threatening fresh groundwater that is especially vulnerable at sea level. Streams, springs, and aquifers easily can be contaminated by runoff from streets and parking lots. Fresh-water issues also include proper management of the Great Lakes, which are considered part of the coastal zones of the United States because of their vast sizes. One of the most serious fresh-water problems is infiltration by sea (salt) water, often known as salt-water intrusion. Fresh water is in short supply in most areas of the United States, but it is especially precious in coastal zones because of the demand for fresh water for drinking, cooking, bathing, irrigation of crops and lawns, and industrial uses. In April 2001, for example, the state of Florida asked for a waiver of federal law, which would allow the state to pump untreated rainwater into underground aquifers that were being depleted at rates much faster than natural seepage could replace them. In order to protect the salt-water and fresh-water resources of the American coastal areas described above, numerous federal laws have been enacted. The most important is the Coastal Zone Management Act (CZMA) of 1972. This law resulted from several studies that showed extensive pollution of the nation's estuaries and that recommended action to clean these up. The legislation also was the result of a growing awareness of environmental problems in the United States, and active pressure from environmental groups such as the Sierra Club, the Audubon Society, and groups such as the Friends of the Earth and the Natural Resources Defense Council. Today over 97 percent of the U.S. shoreline is under the CZMA program. Over the years, the CZMA has been strengthened and expanded. Moreover, additional specialized laws and regulations have been enacted that extend the management of water and coastal resources. The objective of these laws directed at the waters and lands along the seacoast is to lay out a strategic land-use policy that will protect coastal water resources and beaches. The objective of land-use policy is to achieve sustainable development of these coastal resources; that is, using them so that they do not deteriorate but instead have a chance to replenish themselves for future generations. Clearly, coastal water management is a vitally important process for the future prosperity, continued enjoyment, and effective economic use of oceans, beaches, seashores, and coastal waters. SEE ALSO Artificial Recharge ; Balancing Diverse Interests ; Coastal Ocean ; Estuaries ; Land-Use Planning ; Mineral Resources from the Ocean ; National Oceanic and Atmospheric Administration ; Ocean Health, Assessing ; Petroleum from the Ocean ; Pollution of Groundwater ; Pollution of Lakes and Streams ; Pollution of the Ocean by Plastic and Trash ; Ports and Harbors ; Transportation . Barker, Rodney. And the Waters Turned to Blood: The Ultimate Biological Threat. New York: Simon & Schuster, 1997. Cicin-Sain, Biliana, and Robert W. Knecht The Future of U.S. Ocean Policy: Choices for the New Century. Washington, D.C.: Island Press, 2000. Dean, Cornelia. Against the Tide. New York: Columbia University Press, 1999. Celebrating 30 Years of the Coastal Zone Management Act. Office of Ocean and Coastal Resource Management, National Ocean Service, National Oceanic and Atmospheric Administration. <http://www.ocrm.nos.noaa.gov/czm/> . EPA Action Plan for Beaches and Recreational Waters. U.S. Environmental Protection Agency. <http://www.epa.gov/ORD/WebPubs/beaches/> . Gulf of Mexico Hypoxia Assessment. National Ocean Service. <http://www.nos.noaa.gov/products/pubs_hypox.html> .